All network providers in Pakistan offer both pre-paid and post-paid services to their customers; they keep on offering different bundles and packages for both types of users. It’s totally up to you to choose a plan according to your personal needs as each plan has its power. Postpaid plan is best for those who are regular calls and make frequent calls as they never want to run out of balance. They just want to pay only once at the end of the month. We all know that mostly pre-paid costumers always get more benefit of different packages as compared to post customer because telecom companies provide more valuable packages to Ufone customers. But Ufone always cares for its both pre-paid and post-paid customers. This time Ufone comes up with the fantastic offer for its post-paid customer’s, i.e., Ufone Talkville through which you can make unlimited calls to any Ufone number in just Rs.500. You can call on 333. 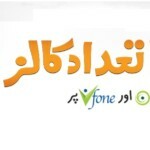 Visit a nearest Ufone franchise or service center. By sending an SMS, type ‘SUB’ to 2500 and wait for the confirmation message. Corporate clients can get this offer through their relationship executive. Only one-time subscription charges of Rs.500 will apply. No additional call charges are included as on pre-paid packages. If Calls are made to any number other than Ufone, usual charges will apply. FED taxes on bill/recharge and other usages will apply according to different regions.18.5% in Islamabad, Gilgit-Baltistan and FATA and 19.5% in other areas. The offer will remain valid for 30 days from the time of subscription. Only post-paid customers can avail Ufone Talkville offer. After the expiration of this offer, it will automatically renew for next thirty days as this is renewable auto offer. Only at the completion of the billing cycle, this offer can be deactivated. After consumption of 10,000 free minutes, rates according to package plan will apply. You can start consuming these minutes after the expiration of package minutes. Charges and volume will be pro-rated. Ufone is the most reliable and affordable network provider in whole Pakistan that provides quality service to both pre-paid and post-paid customers. Ufone is already offering wide range packages for its post-paid customers, and this offer is an unusual addition to the list. You should subscribe this offer so you can enjoy unlimited calls (10,000 minutes) from Ufone to Ufone for a whole month.